Time for a little fun. 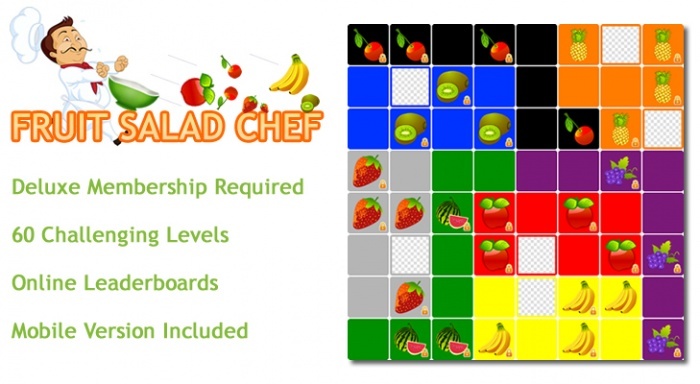 Fruit Salad Chef is an online game, exclusive to StartYourDiet.com. Each game level is an 8x8 grid that must have the correct amount of fruit in each row and column to finish the level. Access the game under the "Track Your Diet" menu and click on "Bonus Items." As you finish each level, your best time will be recorded and if your contact card is set to be viewable, you will be ranked on the leaderboards for best time, between other members. Fruit Salad Chef is also available on the go, on SYD Mobile (under the Learn and Share menu). In fact, if you are using iPad or any touch device, you'll find the mobile version more responsive to your touch and a better option. The mobile version is the full game, including leaderboards. The game is developed using some of the latest internet technologies, therefore it simply might not work with an older web browser. We strongly recommend upgrading to the latest version of your internet browser, which are all free downloads. We try to make everything compatible with all browsers, but in this case, the game simply wouldn't be possible without the technology available in newer browsers. Working on a few technical issues (which, of course, did not occur during our testing!!!). Help...need more instructions as did not know how to play completely...thanks. The best strategy is to eliminate the tiles you know cannot have a fruit. When you start, some fruit are already placed on the board with a lock on them, these fruit cannot be changed. If you already have the correct number of fruit in a column or row when the game starts, you can eliminate all other non-fruit tiles in that row or column. Do this by clicking once and placing the tile into a faded state. Then look for any fruit that already have 4 on the board. You can eliminate the other tiles of that color, because there must be 4 of each fruit. You can generally eliminate a lot right when the game begins. Then the remaining moves, to solve the level, become clearer. Just play around with it and you'll get it. It's fun! Anyone else having problems with the game. I finished it but it doesn't recognize it is complete to close the time and advance to the next level. Same thing happens to me, Dianne. I had that happen too but then found out I had too many of one of the fruits and had to change it up. I am going to test it out again in a bit! @Diane - What browser are you using? I am using firefox but tried chrome as well. @Pink, was your numbers at the top and the side all black like everything was right? Made a few changes to the code. If you've been experiencing issues, can you please try level 18 and report your results to us? Thanks. Just did level 18 and nothing happens when all the numbers turn black. It worked for me on level 18. Well test it out again! @Lyn - I should have clarified, I only made the changes to main version, not the mobile version. Once the fix is made, I'll apply it to the mobile version as well. I played on my computer that time. Sorry, I should have mentioned that. It's a Mac if that makes a difference, OS X Mountain Lion, it is up to date. I just did it on my iPad and it worked. Lol. Computer is downstairs, I'll try that again tomorrow. I think I wasn't playing it right. I wasn't getting 4 of each kind of fruit so once I did that mine worked. We added a one-time notification if you've finished the level but don't have 4 of each fruit. Also, there are some blank leaderboards, that just means someone finished the level, but don't have their contact card setup.